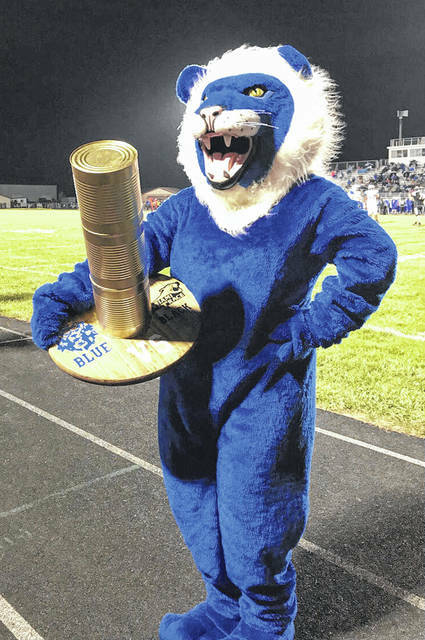 ”George Washington,” the WHS mascot, with the Battle of the Black & Blue can food drive trophy. On Friday night, the Blue Lions aren’t only battling McClain on the gridiron, but also hunger at the gates. Fans who attend Friday’s game at Gardner Park are encouraged to bring canned food items and other non-perishables to kick off the District-wide can food drive. Students of the Superintendent’s Student Advisory Council will be collecting the cans and other non-perishables at both the McHenry Field and Victory Bell admission gates as patrons enter the park. This event will kickoff the WCHCS can food drive that will be held in the school buildings from Monday, Oct. 15 to Friday, Oct. 19. All of the items collected will be donated to The Well at Sunnyside at the end of the month.